A Black Hawk helicopter dropped an equipment bundle on the campus of the Waimanalo Elementary and Intermediate School in Hawaii. 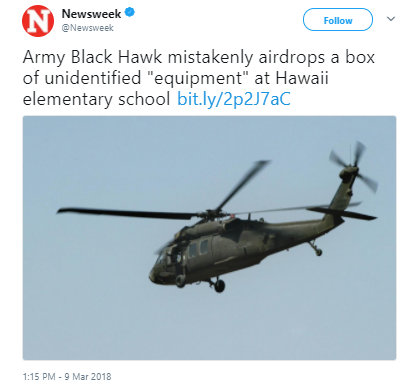 A U.S. Army Black Hawk helicopter from the 25th Infantry Division at Schofield Barracks accidentally dropped an equipment bundle that landed on the campus of the Waimanalo Elementary and Intermediate School in Hawaii, the Honolulu Star-Advertiser reported. The 90-pound bundle was dropped by parachute onto the school’s campus after missing its drop zone by a few hundred yards at Marine Corps Training Area Bellows. “The Honolulu Police Department secured the bundle and returned it to the 25th Infantry Division. The bundle drop was part of training designed to teach soldiers to deliver equipment by parachute from helicopters,” a press release from the 25th Infantry Division read. The package was immediately removed and no one was injured. “The circumstances surrounding this incident are under review to learn and do everything possible to prevent this from happening again,” the press release said. The school sent a letter to students parents explaining to them what happened and offering counseling support to students. The letter also said that if they have questions or concerns, they can speak to someone at the school.